NOW: Um, I know it’s not Friday. This post is just a few days late, but there were just other things I really wanted to write about first (like my first 5K!) It has been so hot here in Buffalo (loving it!) that we have played in the pool almost every day. On Friday our friends from next door came over to play. Hannah is almost 3 and the twins just adore her. Anytime they are in the backyard they go near the fence and call her (Han-nah!!! Han-nah!!!). I usually have to redirect them because Hannah has a 2-month old baby brother so they’re not outside as often as we are. So now, when Hannah’s not out, I tell the twins she’s in the house. “Mommy, Baby” they inform me. Right, she’s inside with her mommy and the baby. It was so cute – Hannah and Ariel had the same bathing suit! 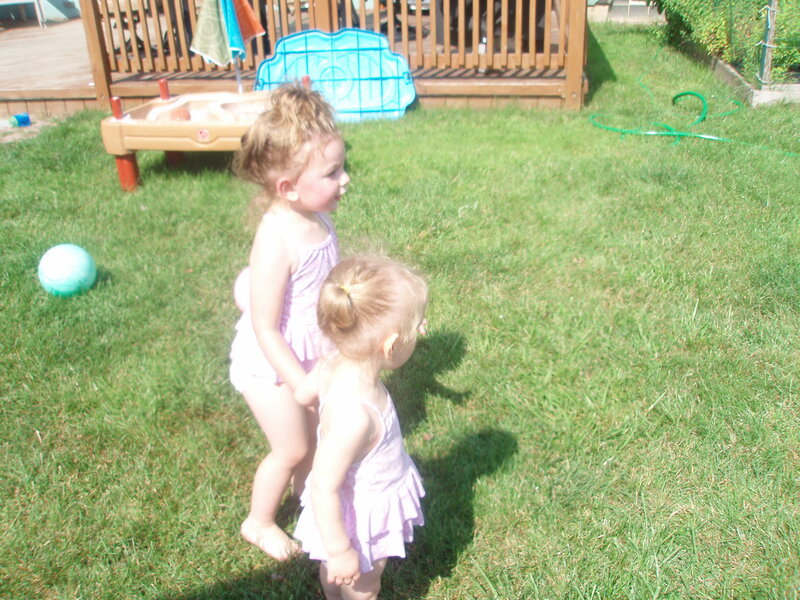 Hannah is so tall though (like her daddy) and she towers over my munchkins even though she’s only a year older. What a difference that year makes though! Hannah talks in full sentences (the twins are starting to string 2 or 3 words together). But especially for her. Hannah pretty much didn’t talk until she was 2. Her mom and dad were a little nervous but the pediatrician kept reassuring them. They wouldn’t run any tests or be concerned until she was 2 1/2 and still not talking. Well, that never happened. Shortly after her 2nd birthday, she started talking in full sentences! And repeating everything anyone says! Amy was asking how I thought she was doing…..I told her the turn-around was simply amazing. I can’t believe her language skills developed so much, when starting off from so little. We’ve been meaning to set up a play-date for a while so hopefully now that this went so well, and I’m off for the summer, we’ll be able to see each other more often. It’s nice for Amy and I to be able to catch up with each other and compare parenting notes, too! This is now. 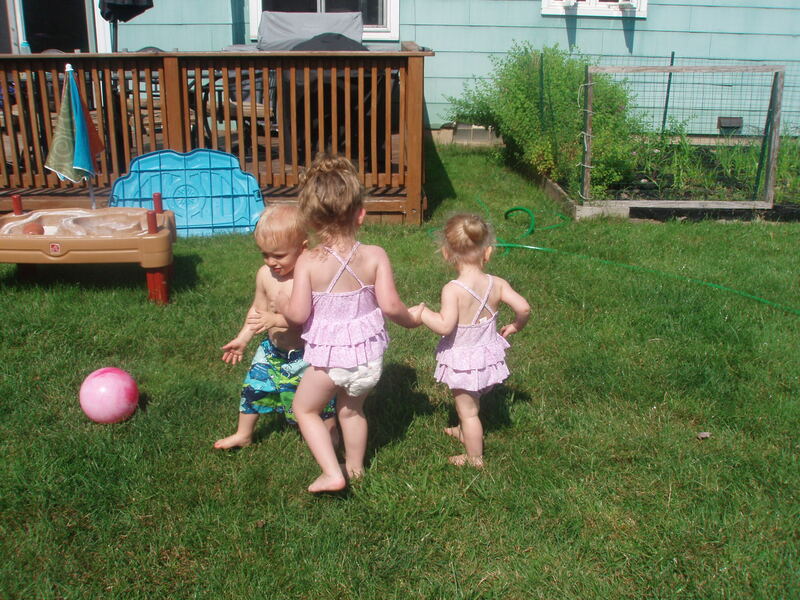 THEN: Before we knew that the twins were a boy and a girl we had two girl names picked out. Not because we thought it was two girls, but just because they came easier to us. I had originally picked out Savannah for a girl. I love love love lions, and lions live on the Savanna, so I liked that idea. I also liked Michelle. Tim liked Savannah better at first. We decided that if we had two girls, the second would be named Charlotte after Tim’s maternal grandmother. Any daughter I ever have will have the middle name Rose, so that was already decided, even if they were both girls. My mom’s middle name is Rose, and she liked it so much she chose it for my middle name also. Then, my sister was born. My parents figured the “Rose” thing was a special bond between my mother and I. I was almost 5 at the time and my feelings might be hurt if there was another girl around with the middle name Rose. They named her Melissa Sue. I threw a fit. Why wasn’t her middle name Rose like mom’s and mine? They had wanted that name anyway, so when they found out that I wasn’t upset….just the opposite…..they went and legally changed her name to Melissa Rose. We were the 3 roses. And all along, Melissa and I agreed that we would carry on this tradition if we ever had daughters of our own. Even Biscuit’s middle name is Rose (she counts – she’s my dog-daughter). Tim was in agreement and both Savannah Rose and Charlotte Rose sounded nice. Then, Tim kinda changed his mind about Savannah. Especially when we were looking up baby names and meanings online. It meant “grassy plain”. Now, I know a savanna is a grassy plain but you’d think the baby name people would have come up with something more fancy. So we started to doubt the name Savannah. He casually remarked that he was surprised I wouldn’t want to name her Ariel. My favorite Disney movie of all time is The Little Mermaid. Well I was shocked. “You’d really let me name her that? After a cartoon?” Well, sure, it’s a pretty name. Well, it was decided. And just another reason not to tell people the names ahead of time. Everyone has an opinion and as soon as they heard that name they’d sure have something to say about it! So Ariel Rose was our first choice and Charlotte Rose was second. Once we found out one of them was a boy it really put the pressure on to figure out a boy name. I couldn’t call Ariel by her name until I knew the boy’s name too. Long ago, probably before we were married, I had told Tim that our son’s middle name could be after Tim’s grandfather, with whom he had been very close. From people talking about him, I knew him as Floyd. That’s what everyone called him. That’s what I (wrongly) assumed the middle name would be. But no, Tim insisted. His grandfather’s real name was Florian. I wasn’t so sure about that. But I had promised. I kept trying to go with Floyd, but he kept insisting, and if it was that important to him I couldn’t say no. But what about a first name? 3 days after we found out the sexes, we had our answer. Brackets. We had so many boy names that we liked that we just couldn’t narrow it down by traditional means. So, we set up something similar to basketball brackets. We took turns pitting two names against each other. We used each choice with the middle name, our last name, the middle and last name together, the name and Ariel together, and nicknames (some names I vetoed just because I didn’t care for the nickname, some because they reminded me of kids at school – LOL). We each took turns getting rid of a name. It took us almost 2 hours, but we finally setttled on William (Will for short, but not Bill or Billy). We were happy. Ariel Rose and William Florian. I was happy because I felt like I could finally talk to my belly properly! That was then. My oldest daughter’s middle name is Rose after my wife’s grandmother. Growing up the tradition in our family was all girls had the middle name of Ann. My sister is Laura Ann and my mom is Sally Ann, but it will be up to my sister to carry on that tradition because my wife and I thought it was a little too boring.